Following up on Wednesday’s release on ratings for Gov. Chris Christie, today we look more closely at this year’s election for governor. NJ state Sen. Barbara Buono is the presumed Democratic challenger, so we look at head-to-head matches between her and Christie. We also asked voters to name the most important problem facing the state and to tell us how closely they are following the race. Bottom line is that Christie continues to hold a very large lead – 30 points – over the nearly unknown Buono. But, this lead is down from 42 points in February, as Democrats have begun to shift to Buono after flirting with Christe, post-Hurricane Sandy. Still, unless Buono can do more than bring the Democratic base home, Christie is in good shape. But there is a lot of time until election day in November. The text of the release follows. Click here for a PDF of the release with text, questions, and tables. NEW BRUNSWICK, N.J – N.J. Governor Chris Christie maintains a dominating, yet shrinking, lead over presumed Democratic gubernatorial candidate state Senator Barbara Buono, according to a new Rutgers-Eagleton Poll. Christie now holds a 30 point lead among registered voters, 57 percent to 27 percent, down from his 42 point lead in a February Rutgers-Eagleton Poll. Christie’s support has dropped six points, while Buono has picked up six points over the past two months, the new poll shows. Regardless of which candidate they prefer, 8 in 10 voters believe Christie will win a second term. Even 61 percent of Buono supporters expect her to lose. While Christie’s favorability rating has declined six points since February, Buono continues to struggle with name recognition. Just 18 percent have a favorable impression of Buono, 12 percent are unfavorable, and 70 percent have no opinion. Nonetheless Buono has made significant inroads, but only because she is finally leading among Democratic voters along with some key constituent groups that usually lean Democratic. Independents remain overwhelmingly in Christie’s camp. 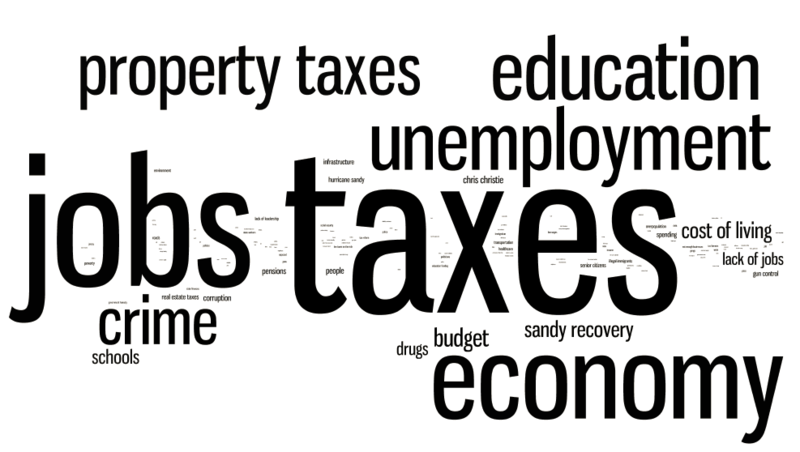 Voters say taxes and jobs are the most important problems facing New Jersey. While Christie’s overall job approval is high at 68 percent, voters are much less positive about his performance on the economy and jobs (42 percent approval) and taxes (37 percent approval). Nonetheless, Christie overwhelms Buono, even among those who are unhappy with these parts of his performance. Results are from a poll of 923 New Jersey adults conducted statewide among both landline and cell phone households from April 3-7. The sample includes 819 registered voters reported on here, with a margin of error of +/- 3.4 percentage points. In February Christie led Buono by four points among Democratic voters. Two months later Buono has an 18 point lead with Democrats, 49 percent to 31 percent. But nearly 20 percent of Democrats remain unsure of whom they will vote for. Buono now also holds leads among some parts of the Democratic coalition including liberals (50 percent for Buono), blacks (45 percent) and voters under 30 years old (43 percent). And while she wins a majority of voters who supported former Governor Jon Corzine , more than a quarter of them say they plan to vote for Christie. Christie has lost few of his 2009 voters, with only about 10 percent either planning to vote for Buono or unsure. He maintains large leads among voters at all income and education levels, and even has a 53 percent to 29 percent lead among women. His margin among men is even larger at 60 percent to 24 percent. Christie’s support is also statewide, with large majorities in every region except urban counties, where voters are almost evenly split, giving Christie a small four point lead. One key to Christie’s continuing support is the 65 to 16 percent lead he holds among independent voters. At this still-early stage of election season, about half of voters say they are following the election either “Very closely” (12 percent) or “Somewhat closely” (36 percent.) But another third are not following the campaign closely, and 19 percent are not following it at all. Christie’s lead over Buono is just as strong among those paying careful attention as those who admit they are paying little attention. Regardless of whom they support, most think that Christie will get a second term. Even most Democrats (70 percent), those unfavorable toward Christie (64 percent), those favorable toward Buono (75 percent), and those who plan to vote for Buono (61 percent) think that the governor will win in November. As reported earlier this week, Christie’s favorability rating is down 6 points from February, while his overall job performance approval dropped 5 points. Nonetheless, about two-thirds of voters respond positively to the Governor, and few have no opinion. Buono, however, remains largely unknown statewide and has seen no increase in recognition or favorability since February. Even 63 percent of Democratic voters report no impression of her. Three in ten Democrats are favorable, while only seven percent have an unfavorable impression of the Democratic candidate. Three-quarters of independents have no opinion of Buono, while 12 percent view her favorably, and 13 percent are unfavorable. Buono also remains all but unknown to 72 percent of Republicans, with just 4 percent favorable and 24 percent unfavorable. Even most typical Democratic supporters such as women (74 percent), black voters (68 percent) and voters belonging to public union households (66 percent) have no impression of Buono. Asked to name New Jersey’s most important problem in their own words, 26 percent of voters identify taxes. Mentions of lack of jobs and unemployment follow closely behind at 24 percent. Ten percent name the economy in general, and another ten percent say education is the most important problem. The list is rounded out with crime and drugs at eight percent and government spending, waste, and corruption at six percent. Democrats are more likely to say unemployment and jobs are most important (26 percent), followed by education and taxes, which tie for second at 16 percent. For independents, taxes are the top concern, with one-third expressing frustration with high taxes. Unemployment and jobs follows at 20 percent. Just over a third of Republicans also says taxes are most important, with another 24 percent calling jobs and unemployment the top problem. Sixty-one percent of voters who name taxes as the most important problem believe Christie is spending too little time on the problem. Similarly, 59 percent of voters who say jobs are the key problem, express the same concern. Moreover, only a minority of all voters approve of the Governor’s performance in either of these areas. Despite this, Christie easily beats Buono among voters naming taxes or jobs as their top problem; illuminating the problem she faces in trying to unseat the Governor. One would think that a firmly democratic state would have a greater interest in dashing the Republican governor’s presidential aspirations for 2016. No one likes to see their governor crisscrossing the country campaigning for higher office.